A single incline cantilever employs agile industrial design techniques to increase production yield and lower material and installation costs, maximizing your return on investment. Designed for parking arrays of one row. 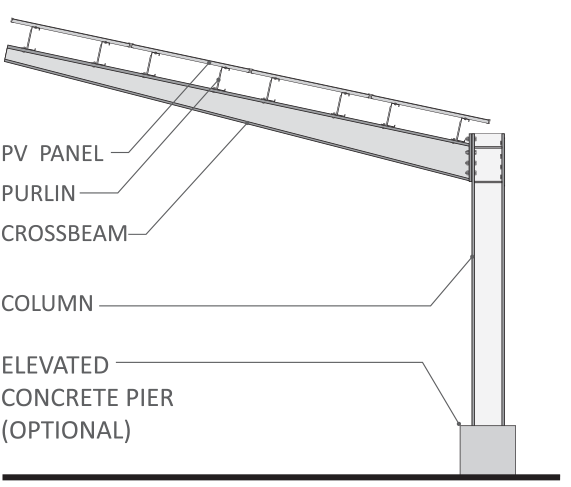 A double incline cantilever otherwise known as a ‘T’ structure, can be with either straight or tapered beams. Designed for parking arrays of two rows. A garage top canopy installs efficiently on both new and existing parking garages, scaling to match your unique structure while maintaining the ideal southern exposure—regardless of garage orientation. A long span canopy brings the flexibility of our garage top solution to ground lots. Each structure covers two parallel parking rows and an internal drive aisle using a single contiguous PV-covered canopy, maximizing energy production.